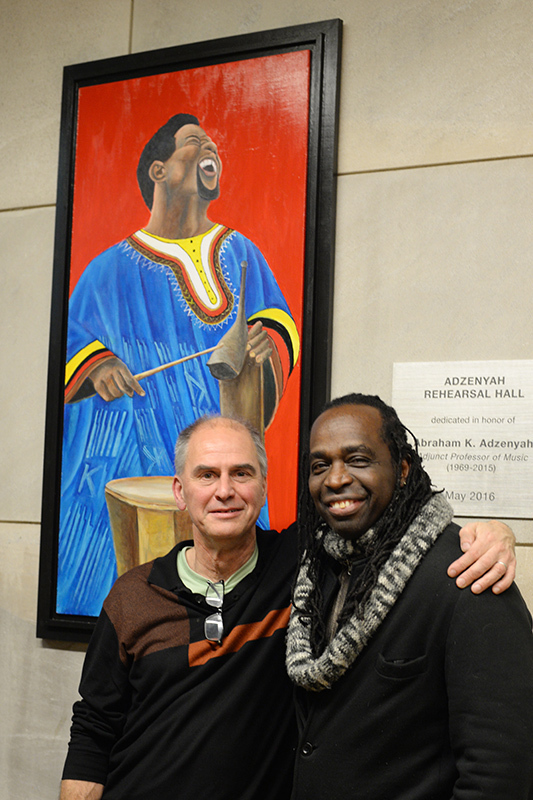 Hanging in the Abraham Adzenyah Rehearsal Hall is a new portrait of Abraham Adzenyah MA ’79, master drummer and adjunct professor of music, emeritus, painted by local artist, Pierre Sylvain. After 46 years of teaching at Wesleyan, Adzenyah was honored during a special retirement ceremony this past May. The ceremony included a building dedication of the Abraham Adzenyah Rehearsal Hall, formerly Rehearsal Hall. Two farewell concerts followed, featuring 150 musicians in West African music and dance ensembles from across the Northeast, culminating in an all-night dance party. Sylvain was contacted by Ronald Kuivila, chair of the Music Department, director of the electronic music and recording studios, and professor of music, to paint Adzenyah’s portrait, using acrylic paint. Sylvain first met Adzenyah 20 years ago, and painting his portrait gave them a chance to reconnect.